Pope Benedict XVI will celebrate mass for up to 250,000 people at Coventry Airport on 19 September. The details of the Pontiff's visit to the city were released by the Archdiocese of Birmingham earlier. While at the airport, the Pope will beatify Cardinal John Henry Newman, who died in 1890. 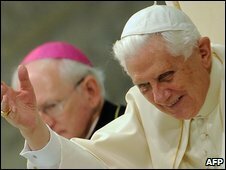 A diocese spokesman said it was a "tremendous honour" as it will be the first time Pope Benedict has performed a beatification. Pope John Paul II held a mass at the airport in May 1982. Invitations will be distributed through parishes, schools and other institutions, the archdiocese said. Cardinal Newman, a convert to Roman Catholicism from Anglicanism, could eventually become the first non-martyred English saint since the Reformation. He founded Birmingham Oratory and was known for his work with the poor. His progress to beatification came about after American Deacon Jack Sullivan, 70, of Boston, Massachusetts, prayed for his help while suffering intense pain in 2001 and said that later he was completely free of pain. The deacon is to attend the Coventry mass.